Ruth also showed me two books that day. 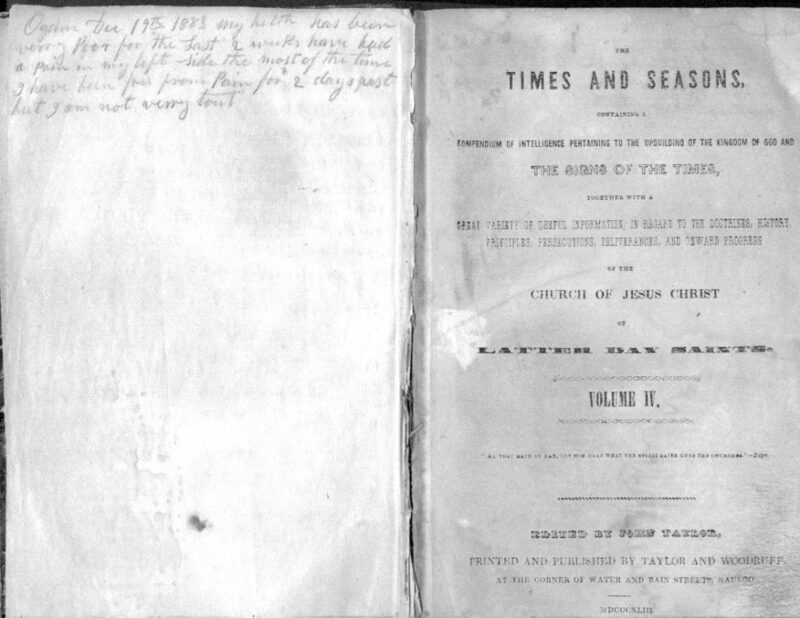 One was the family bible kept by Great grandfather Orson H. Eggleston with records in it. The other she casually handed me saying “This book has some stuff written in the front.” I was impressed first because this was a bound volume of The Times and Seasons. This was a newspaper which had been printed in Nauvoo, Illinois. 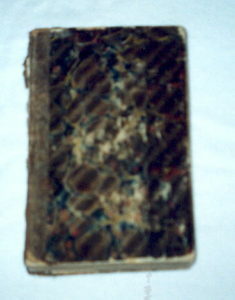 Papers from 1842 and 1843 were bound in this Volume IV, which he owned. The publication date is identified by Roman Numerals MDCCCXLIII, which would be 1843. I was more impressed by what Samuel Eggleston had written in it. 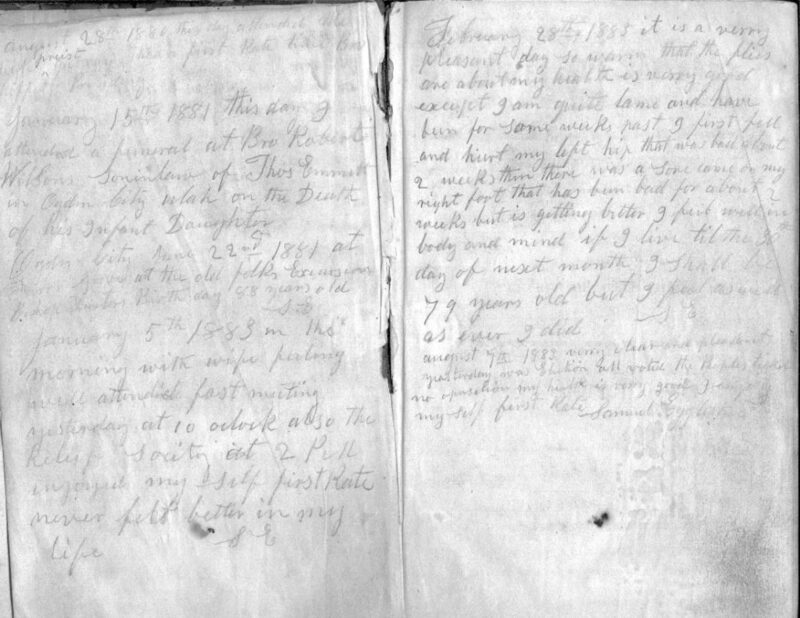 On the front blank pages in the book, Samuel had made some journal entries. The initial entry appears to be only “Ogden City S. E.” probably written to identify the book as his. Some additional entries followed: “Ogden City Dec 30/66, Ogden City Dec 29/72, Ogden City July 16/75 S. E., Ogden City Jan 23/78 S. E. , Ogden City Jan 12/79.” It is interesting that he made successive entries apparently still with only the place, date, and his initials. From this we can assume that he possessed the book as early as 1866 and possibly earlier. The first entry with any additional information was dated March 7/79 and stated only “Stayed at home on account of bad cold.” The next, Dec 3, 1879 Wednesday, was also very newsy “Rained all last night it had been raining all day now ½ past 3 S. E.” Christmas Day 1879, Samuel must have picked up this book as he spent a lonely day home alone. 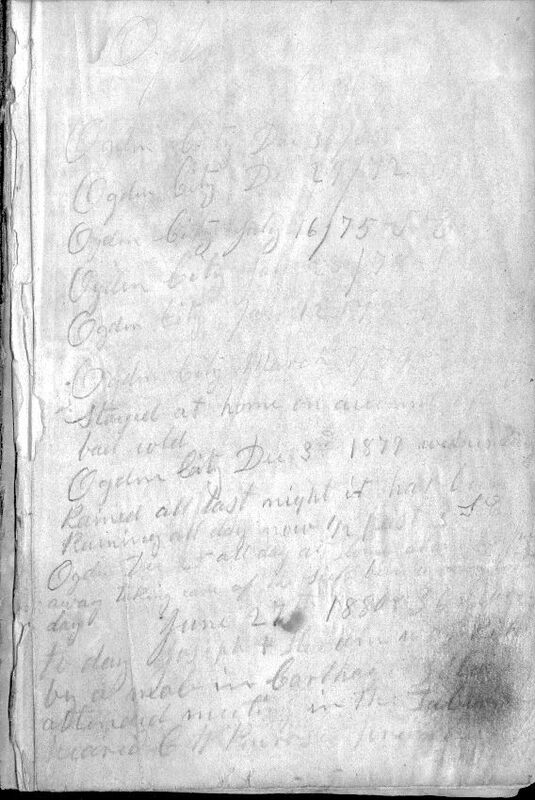 He wrote: “Ogden Dec 25 all day at home alone wife away taking care of the sick been away all day”. The next gave a very brief account of a rather significant occasion: “Ogden City Jun 22nd 1881 at Farr’s grove at the old folks excursion Bishop [ Newton ] Birth day 88 years old S. E.” Farr’s grove was a large Orchard owned by the Farr family. Samuel’s son-in-law Enoch Farr owned part of this land. This “grove” was used as a park or gathering place. Later part of it became what is now “Lorin Farr Park”. “Old Folks Day” celebrations began in 1875 in Salt Lake City. In June 1881, Ogden was host of the “Old Folks Day” Celebration. For this event, 650 people from Salt Lake and Davis Counties joined the Weber County old folks at Lorin Farr’s grove, being conveyed from the Depot in 285 wagons. President John Taylor, George Q. Cannon, and Wilford Woodruff were in attendance along with prominent citizens of Weber County. The first indication of any health problems was February 28th 1883. He wrote “it is a very pleasant day so warm that the flies are about my health is very good except I am quite lame and have been for some weeks past I first fell and hurt my left hip that was bad about 2 weeks then there was a sore come on my right foot that has been bad for about 2 weeks but is getting better I feel well in body and mind if I live till the 30th day of next month I shall be 79 years old but I feel well as ever I did.” So in spite of some health problems, he still felt very blessed by good health. An entry August 7th  showed Samuel’s continuing interest in politics, though he didn’t mention whether he was on the ticket for this election. He wrote: “clear and pleasant yesterday was Election all voted the Peoples ticket no opposition my health is very good I enjoy my self first rate. Samuel Eggleston” This was the only notation with his complete signature. The signature is very similar to the one on probate records of his father Samuel in Springwater, New York. It appears that Samuel’s health began to decline during the last months of his life. 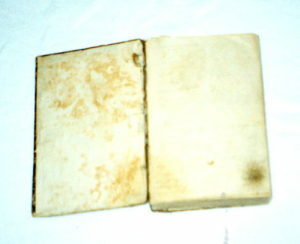 The last notation in this book was dated Ogden December 19th 1883, and stated: “my health has been very poor for the last 2 weeks have had a pain in my left side the most of the time I have been free from Pain for 2 days past but I am not very [stout]” There was nothing more written after this. Samuel died May 26, 1884. Along with the box of papers, Ruth let me take these two books that day to photocopy the inscriptions. I must admit that I was seriously tempted to keep this book. But I did return it. A few years after that Ruth passed away. I have no idea who currently has possession of this book, but I hope that they appreciate the treasure that it is and take good care of it. It is so much more than just a rare old book – it is a small window into the life of our ancestor. Note: Text for this post has been taken from my book The Joseph Eggleston Family: Seven Generations from Joseph (d.1767) of Stonington, Connecticut to Joseph (1885-1965) of Utah and Wyoming (Including Maternal Lines: Hill, Burgess, Titus, Sammis & Johnson) pp. 391-392. This entry was posted in Family heirlooms, My Stories of Discovery and tagged Eggleston, heirlooms, Journal, Record keeping, Utah. Bookmark the permalink. This was interesting. Thanks for sharing. Thank you Carol for reading and for your interest in my books.